© 2017 Paolo Melchiorre "Posing at Punta Aderci in Abruzzo, Italy"
I graduated with a degree in Computer Science from the University of Bologna. My thesis was about Free Software and since then I've been a Free Software advocate. I've been a GNU/Linux user since 2000 and now I'm a happy user of Ubuntu. In 2007 I attended my first conference, the Plone Conference, and since then I've attended many other pythonic conferences in Europe. © 2017 Paolo Melchiorre "Giving a talk at EuroPython 2017"
I've lived and worked in Rome and London, and since 2015 I've been a remote worker located in my hometown of Pescara, Italy. I like improving my English skills by reading fiction books or listening audiobooks, watching TV series and movies, listening podcasts and attending local English speaking meetups. 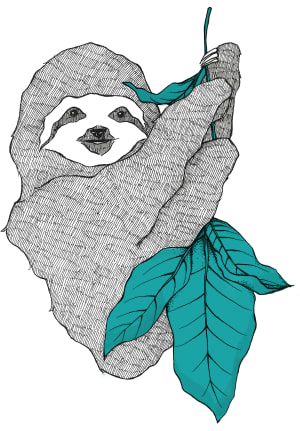 I started programming with Pascal during high school and then I learned HTML and CSS on my own to develop my first website as my final project for high school. I realized how much better Python was for me than other languages I've studied and used before because it's easier to learn. It focuses on code simplicity and readability, it's extensible and fast to write and has a fantastic community. When I stopped using Plone I continued using Python as my main programming language. I work every day with Django and PostgreSQL, so apart from the Django framework itself I think my favorite python library is the Python-PostgreSQL database adapter psycopg2 because it's pretty solid and allows me to work with the database without the Django ORM when I need to do very low level operations or when I want to use all the great features of PostgreSQL. Originally I started working with Plone and the Zope application framework which stores all information in Zope's built-in transactional object database (ZODB). Then I started using Django when I needed to store data in a relational database like PostgreSQL, and after some research, I realized it was the best choice. I love its architecture, the ORM, the admin module, the PostgreSQL support, all its ready-to-use modules like GeoDjango, all the 3rd party packages, and particularly the community behind it. 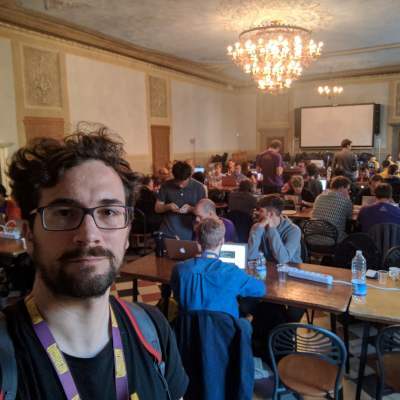 © 2017 Paolo Melchiorre "Sprinting at DjangoCon Europe 2017"
I started contributing to the core of Django during the sprint day at DjangoCon Europe 2017 with a pull request that integrated the PostgreSQL crypto extension in its contrib package and then was merged in Django 2.0. 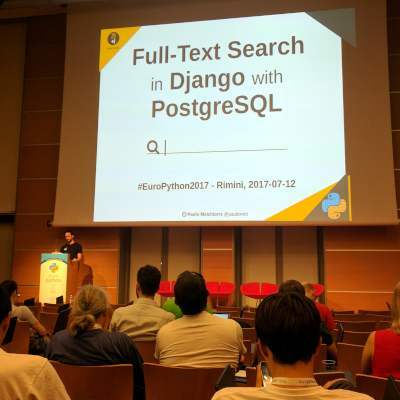 I presented a talk about the Django Full-text search feature at the PyCon Italy 2017 conference and then wrote the article "Full-text search with Django and PostgreSQL" based on this. Later I realized that the Django Full-text search function was not used on the djangoproject.com site. © 2017 Paolo Melchiorre "Sprinting at EuroPython 2017"
I presented a talk about this experience as an example of my contribution to the Django project. 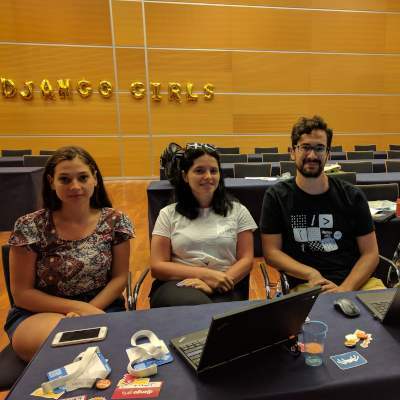 © 2017 Paolo Melchiorre "Coaching at Django Girls EuroPython 2017"
I'm attending some Django Girls workshops as a coach and I've contributed to its tutorial. In addition, I'm updating my Django Queries project with code I've used in my talks which lets people try it on their own. I'm working on a Django project template we use at work to speed up the bootstrap of a project deployed on uWSGI. I'm updating my Pelican-based technical blog where I post some articles, information about me, my projects and my talks. I'm updating my YouTube channel with all my recorded talks and my Speaker Deck account with all my talk slides. I'm also answering as many python-related questions as I can on Stack Overflow, particularly related to Django, Full-text search and PostgreSQL and I wrote the article "Updating a Django queryset with annotation and subquery" based on one of them. 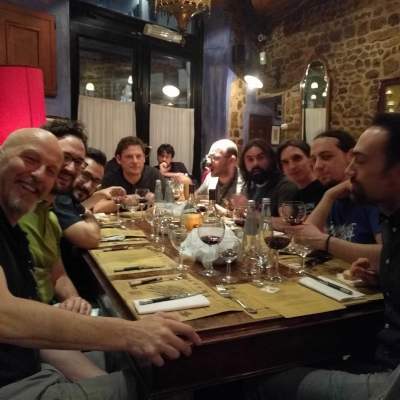 © 2017 Paolo Melchiorre "Having fun at PyFiorentina during PyCon Italy 2018"
I also want to say to all native English-speaking developers that there a lot of excellent developers who hesitate to contribute to Free Software because of their lack of English knowledge. Personally, I waited a long time before contributing to projects and actively participating in the community and then I forced myself to improve my English skills with a lot of costs in term of time, effort and money. This article is based on the answers I sent to Mike Driscoll for an email interview for his blog, The Mouse Vs. 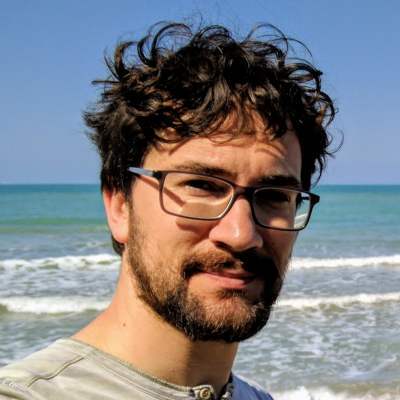 The Python, ️published on 11th February 2019, in the article "PyDev of the Week: Paolo Melchiorre". One of the things I have always disliked is when people start with "Excuse my poor English". There is absolutely never a reason to apologize that your second, or third, language isn't that great. Most native English speaking people cannot even formulate a sentence in an other language. Sure they can write code in C, Pascal, Java, Python, Ada, Basic, Fortran, Algol, Prolog, Haskel, Brainfuck, ... but they cannot even say "hello" in French, Spanish, German, or Klingon?! Get down to brass tacks*, and language will less be an issue. (*) This means, get to the facts. Sling the lingo and it will make up for the lacking skills in English. PS, English is not my native language either. Hi Michiel, thanks for your appreciation and for your comment. I wrote this article and other things in the past, so I'm no longer in the "Excuse my poor English" phase, but actually I was there in the past and had to study a lot to no longer be there. 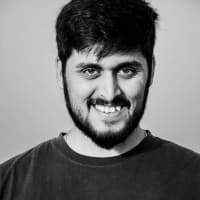 I made a lot of efforts to complete the university and to be a good software developer, but by the age of 30 I realized that I could read English but I couldn't speak or write it, and this was a real obstacle in being appreciated as a software developer, and in contributing in free software. I started doing a lot of things to learn English: taking courses, reading articles and books, watching series and videos, listening to podcasts and lectures. I started attending regular meetings to speak in English and I changed the language of all my things: pc, telephone, tv, .... I also lived for a few months in London, and spent a lot of time, effort and money doing this. In the meantime I worked as a software developer, I had side projects, I studied a lot of technical things, I attended some local technical meetings, national and international conferences and I started giving talks. 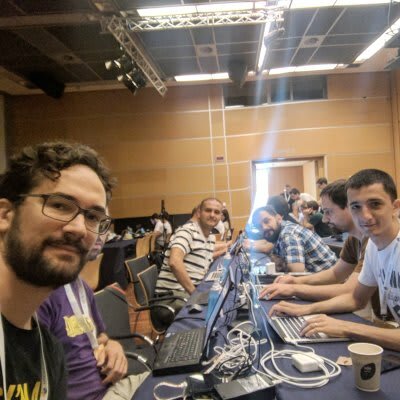 I am happy to read and listen about the inclusiveness in these years in the field of Free Software and in various technical conferences and I wanted to highlight another thing that can really exclude you from the community, regardless of how good you are technically.